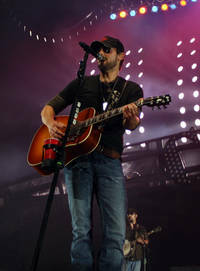 Kenneth Eric Church (born May 3, 1977) is an American country music singer and songwriter. Signed to Capitol Nashville since 2005, he has since released a total of five studio albums for that label. His debut album, 2006's Sinners Like Me, produced three singles on the Billboard country charts including the top 20 hits "How 'Bout You", "Two Pink Lines", and "Guys Like Me". His second album, 2009's Carolina, produced three more singles: "Smoke a Little Smoke" and his first top 10 hits, "Love Your Love the Most" and "Hell on the Heart". 2011's Chief, his first No. 1 album, gave him his first two No. 1 singles, "Drink in My Hand" and "Springsteen", and the hits "Homeboy", "Creepin'", and "Like Jesus Does". His third No. 1 single was "The Only Way I Know", which he, Jason Aldean, and Luke Bryan recorded for Aldean's album Night Train". A fourth album, The Outsiders", was released in February 2014. It produced five new singles between 2013-15 with the title track, "Give Me Back My Hometown", "Cold One", "Talladega" and "Like a Wrecking Ball". "Talladega" and "Give Me Back My Hometown" each reached number one on the Country Airplay chart. Eric Church got his sixth No. 1 hit with Keith Urban in May 2015 with the single "Raise 'Em Up". He released his fifth studio album, Mr. Misunderstood, on November 3, 2015. This webpage uses material from the Wikipedia article "Eric_Church" and is licensed under the GNU Free Documentation License. Reality TV World is not responsible for any errors or omissions the Wikipedia article may contain.